PITTSBURGH (AP) — The man charged in the Pittsburgh synagogue massacre was brought into court in a wheelchair Monday, as some members of the Jewish community and others objected to President Donald Trump’s plans to visit, accusing him of contributing to a toxic political climate in the U.S. that might have led to the bloodshed. With the first funerals set for Tuesday, the White House announced that Trump and first lady Melania Trump will visit the same day to “express the support of the American people and to grieve with the Pittsburgh community” over the 11 congregants killed Saturday in the deadliest attack on Jews in U.S. history. Some Pittsburghers urged Trump to stay away. 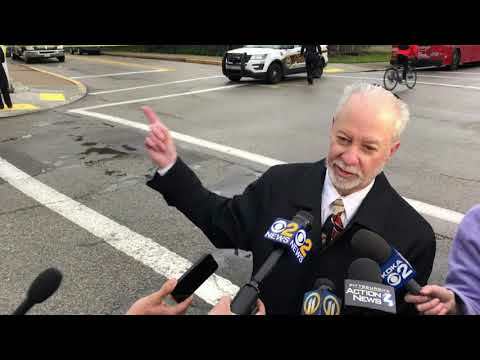 “His language has encouraged hatred and fear of immigrants, which is part of the reason why these people were killed,” said Marianne Novy, 73, a retired college English professor who lives in the city’s Squirrel Hill section, the historic Jewish neighborhood where the attack at the Tree of Life synagogue took place. Meanwhile, the alleged gunman, 46-year-old truck driver Robert Gregory Bowers, was released from the hospital where he was treated for wounds suffered in a gun battle with police. Hours later he was wheeled into a downtown federal courtroom in handcuffs to face charges. A judge ordered him held without bail for a preliminary hearing on Thursday, when prosecutors will outline their case. He did not enter a plea. During the brief proceeding, Bowers talked with two court-appointed lawyers and said little more than “Yes” in a soft voice a few times in response to routine questions from the judge. Courtroom deputies freed one of his cuffed hands so he could sign paperwork. “It was not the face of villainy that I thought we’d see,” said Jon Pushinsky, a congregant who was in court for the hearing. The weekend massacre — which took place 10 days before the midterm elections — heightened tensions around the country, coming just a day after the arrest of the Florida man accused of sending a wave of pipe bombs to Trump critics. The mail bomb attacks and the bloodshed in Pittsburgh set off debate over whether the corrosive political atmosphere in Washington and beyond contributed to the violence and whether Trump himself bears any blame because of his combative language. Pittsburgh Mayor Bill Peduto, a Democrat, said the White House should contact the victims’ families and ask them if they want the president to come. He also warned Trump to stay away when the first funerals are held. Some looked forward to the president’s visit. “I am a citizen. He is my president,” Myers told CNN. The youngest of the 11 dead was 54, the oldest 97. The toll included a husband and wife, professors, dentists and physicians. Bowers was charged with offenses that included causing death while obstructing a person’s right to the free exercise of religion — a hate crime — and using a gun to commit murder. He was also charged under state law with criminal homicide, aggravated assault and ethnic intimidation. The president of the hospital where a wounded Bowers was taken said that he was ranting against Jews even as Jewish staff members were treating him. Cohen, who is also Jewish and a member of Tree of Life synagogue, said he stopped by Bowers’ room. He said the FBI agent outside Bowers’ room told him he didn’t think he could have done that. “And I said, ‘If you were in my shoes I’m sure you could have,’” Cohen said. Just minutes before the synagogue attack, Bowers apparently took to social media to rage against HIAS, a Jewish organization that resettles refugees under contract with the U.S. government. HIAS had recently weighed in on the migrant caravan heading toward the U.S. from Central America, urging the Trump administration to “provide all asylum seekers the opportunity to present their claims as required by law.” The president has vilified the caravan and pledged to stop the migrants. One of the targets of the mail bomb attacks last week was liberal Jewish philanthropist George Soros, who has been accused by far-right conspiracy theorists of paying migrants to join the caravan. Bowers was a long-haul trucker who worked for himself, authorities said. Little else was known about the suspect, who had no apparent criminal record. This story has been corrected to fix the spelling of “Pushinsky” and “Jeffrey” and to show Jeffrey Cohen’s comments were made to “Good Morning America,” not WTAE-TV. Associated Press reporters Claudia Lauer and Kristen de Groot contributed to this report from Philadelphia.